Composed by Arvo Part (1935-). Bible, St Matthew 5, 3-12. World Premiere: in Nathanaelkirche Berlin / Germany by the Theatre of Voices conducted by Paul Hillier. Choral part(s). With Standard notation. Composed 1990/1991. Duration 7 minutes. Universal Edition #UE33003. Published by Universal Edition (PR.UE033003). 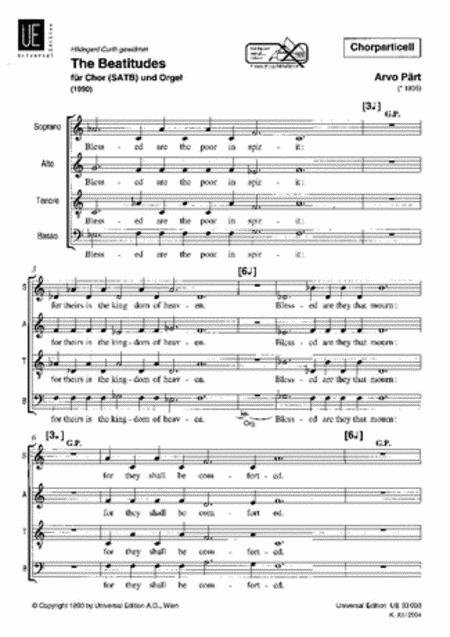 Composed in 1990, and revised in 1991, for SATB Choir or soloists with organ accompaniment, Part's setting of The Beatitudes is one of only a handful of works (Litany and And One of the Pharisees also falling into that category) composed in English. Taken from Jesus' Sermon on the Mount, as found in Matthew 5:1-12, The Beatitudes provide a fitting structure for Part's setting. Each verse states a godly quality and the blessing attached to it; all except the last verse begin with the word "blessed." 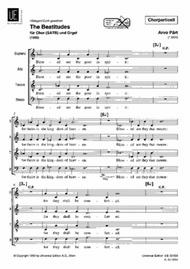 The Beatitudes was premiered on 25 May 1990 at the Nathanaelkirche, Berlin, by the Theatre of Voices choir, conducted by Paul Hillier.